the hair, originally uploaded by double © photography. Here's a great hairstyle for your little flower girl-- a french braid that winds through her hair with baby's breath and roses. It keeps the flowergirl look neat and tidy too! 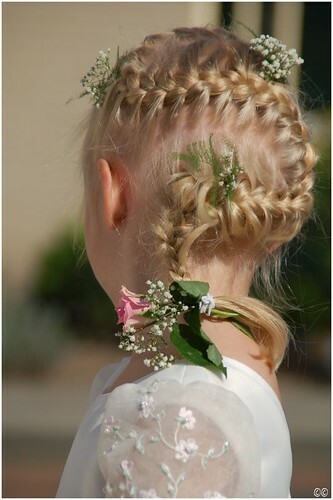 Keywords: braids, wedding hairstyles, wedding hair, flowergirl hair ideas, possible flower girl hair ideas.